Tails in the City pet boutique is proud to be a sponsor for the 2nd Annual Haute Dog Chicago runway doggy fashion show on September 14th at The Peninsula Chicago to benefit Canine Companions for Independence! 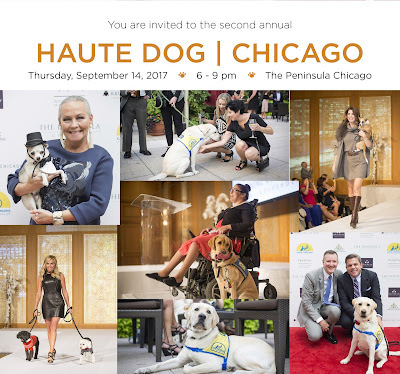 HAUTE DOG | CHICAGO is a high-end fashion show featuring some of Chicago’s finest alongside their couture canines and Canine Companions dogs. Participants and dogs will be outfitted in the latest fall fashions from local boutiques. In addition to highlighting the upcoming trends on Michigan Avenue, you will enjoy delicious cocktails and hors d'ouvres on the terrace at The Peninsula Chicago. In addition, the evening will also include a silent auction with a wide variety of items for everyone in attendance. Don't miss this exciting event and help us raise money and awareness for Canine Companions for Independence. Please click HERE to purchase tickets for our event! Please note, only Canine Companions dogs, other assistance dogs and dogs that are participating in the fashion show are permitted at the event. Fashion show participants are arranged prior to the event. No other dogs will not be permitted.